Over the last few years researchers at Universidad Javeriana Bogotá, a University in Colombia, have been looking into using SDRs for aerial landmine detection. 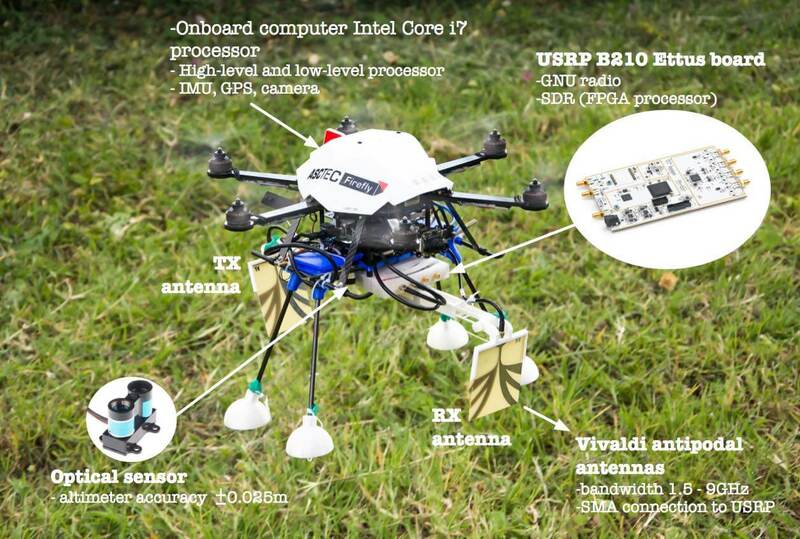 The research uses a USRP B210 software defined radio mounted on a quadcopter, together with two Vivaldi antennas (one for TX and one for RX). The system is then used as a ground penetrating radar (GPR). GPR is a method that uses RF pulses in the range of 10 MHz to 2.6 GHz to create images of the subsurface. When a transmitted RF pulse hits a metallic object like a landmine, energy is reflected back resulting in a detection. This chapter presents an approach for explosive-landmine detection on-board an autonomous aerial drone. The chapter describes the design, implementation and integration of a ground penetrating radar (GPR) using a software defined radio (SDR) platform into the aerial drone. The chapter’s goal is first to tackle in detail the development of a custom designed lightweight GPR by approaching interplay between hardware and software radio on an SDR platform. The SDR-based GPR system results on a much lighter sensing device compared against the conventional GPR systems found in the literature and with the capability of re-configuration in real-time for different landmines and terrains, with the capability of detecting landmines under terrains with different dielectric characteristics. Secondly, the chapter introduce the integration of the SDR-based GPR into an autonomous drone by describing the mechanical integration, communication system, the graphical user interface (GUI) together with the landmine detection and geo-mapping. This chapter approach completely the hardware and software implementation topics of the on-board GPR system given first a comprehensive background of the software-defined radar technology and second presenting the main features of the Tx and Rx modules. Additional details are presented related with the mechanical and functional integration of the GPR into the UAV system.